MWC 2016: Discreet smart features are a girl's best friend, right? HP isn't making its own smartwatches. Instead, it's choosing to work with watchmakers and fashion designers, providing the brains behind sleek exteriors. 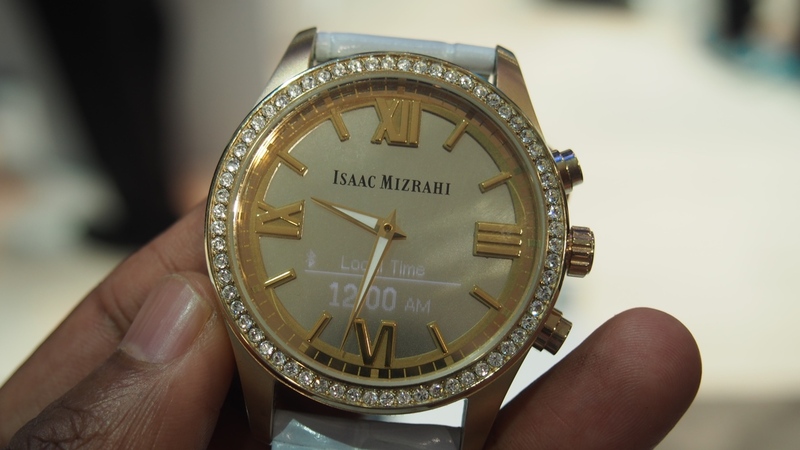 The Isaac Mizrahi watch is the first of the tech giant's partnerships to produce a smart analog watch for women. It's a $249, Swarovski crystal-encrusted timepiece created by the Brooklyn based designer that delivers subtle notifications from your Android or iOS smartphone. Our features editor Sophie thinks it's a little too blingtastic and I'd be inclined to agree. What we also agree on is that there's one interesting feature on show here and it's to do with the display. Did you even notice it in the main pic? Unlike some of the other female-focused designer smartwatches we've seen (like the Guess Connect), beneath the mineral glass lies an embedded OLED screen, that's only visible when notifications come through from your phone. There's no big display eating into the watch face and breaking up a reasonably attractive design and that's definitely a good thing. That smartphone support is pretty much the same you'll find on other HP-powered watches though. Like the Titan Juxt, Movado Bold and the MB Chronowing, it'll flash up things like calendar alerts or send a gentle vibration to the watch when a call is coming through on your phone. It's the same companion app as well with a few extras like getting updates from the fashion designer's Twitter feed.